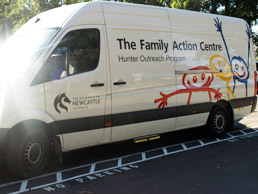 Hunter Outreach Project is a family support service offering a range of activities & assistance to families in the lower Hunter region of NSW. All services are offered free to families who require some extra support. We work to build upon existing family strengths by fostering positive family and community relationships. We have long-term relationships with many health, government and non-government agencies. We are proud of our extensive collaboration to provide highly supportive activities to families. These activities are responsive to what the families are telling us they require. Current long term collaborations include our work with Family Support Newcastle to provide a supported playgroup at the Hamilton South social housing estate. Parent-child attachment, child development, school readiness, early literacy competency and healthy eating are focus areas of this inclusive group. Everyone with children 0 – 6 years is welcome. Another long-term collaboration is our partnership with ‘The Place’ (the community centre at Charlestown Square), SVDP Ability Links and Lake Macquarie City Council to facilitate a supported playgroup for young parents each Friday. The young parents, with their children, come together to share their experiences, learn from each other and participate in conversations with health and child development practitioners who come to the group as visitors on a rotating basis. This playgroup is successful because everyone involved respects everyone who attends - age does not determined your ability to parent successfully. 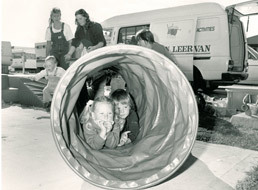 To assist families who have children under the age of 18 who require some extra support. To design, deliver and support strength-based programs in collaboration with families and community. To encourage and support families to identify and achieve goals. To promote a sense of family belonging in communities. Our staff know that all families have assets and strengths, and we work with families to develop these assets and strengths in order to help build more resilient communities. Parenting is often a challenging and rewarding time of life. For many people a few tips and ‘tricks of the trade’ are welcome at some stage during their parenting experience. Various parenting programs have been designed and developed to address some of the more challenging periods in family life and are regularly available. These programs not only provide parents and carers with new skills to make their parenting more enjoyable, they also offer an opportunity to meet other parents and socialise. Take care of yourself and feel confident that you are doing the right thing.